I kind of failed on the thanksgiving recipes this year. Blogging 101 says that you latch on to EVERY major holiday and create all the recipes you can around that recipe. Yes, that includes Pi Day, National pet day, and National nutella day (I made that last one up but also, I bet/ hope it’s a thing already!). Anyways, Thanksgiving is up there at the top of the list. I do have this recipe that is Thanksgiving-y that I created and photographed LAST YEAR! I’ve been sitting on these photos and this recipe for a whole year! I’m honestly not really sure why but the time never felt right to post it….until now that is. It’s also perfect because I still have about 15-20 butternut squash crowding a table in our house and Stephen asks me every week when I’m going to do something with them. 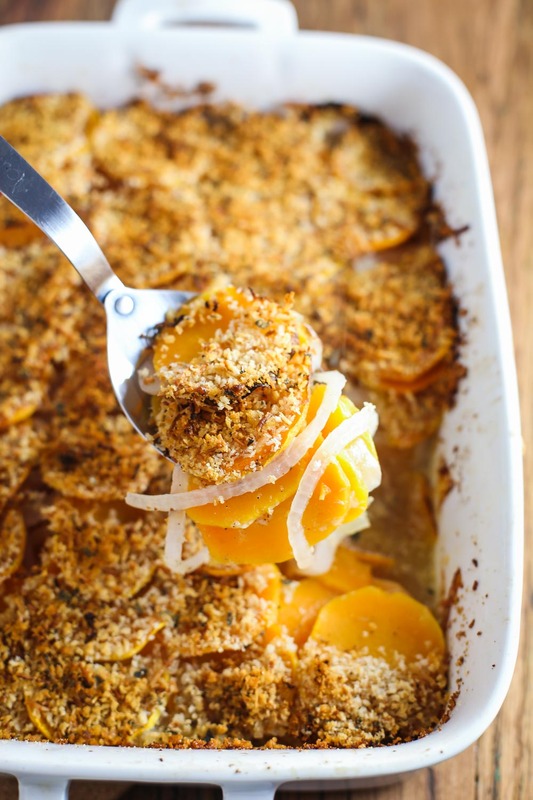 :) Hello, Butternut Squash Au Gratin! Lets make this au gratin! I used 2 small-medium butternut squash (I keep wanting to type squashES, but that’s not right). They were peeled, sliced into thin coins, layered in the pan, and topped with onions. Then more of the squash coins are stacked in and eventually it’s all topped with a simple and yummy panko/ herb/ parmesan mixture. I used real parmesan in the original recipe and photos but have since made it with THIS vegan parmesan from Minimalist Baker and it tastes JUST as yummy! Then it’s baked. But side note: raw butternut squash is totally yummy! Maybe that’s just me but I kind of love it! It’s like eating a raw carrot but honestly, kind of better! (try it!!) But to clarify: I’m not advocating a raw au gratin. That would be weird…. 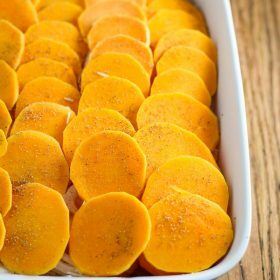 While this is more traditionally something that you would serve as a side dish, it also makes a deliciously filling main dish (or at least, I do recall eating this right out of the pan when I was too lazy to cook anything else for dinner). Hey, at least I’m eating veggies, right? Happy Friday, friends! I hope you have a marvelous and relaxing autumnal weekend (are you listening to Christmas music yet? I think this weekend is a good time to start ;)). Pre-heat the oven to 400 degrees F. Generously grease a rectangular baking dish. 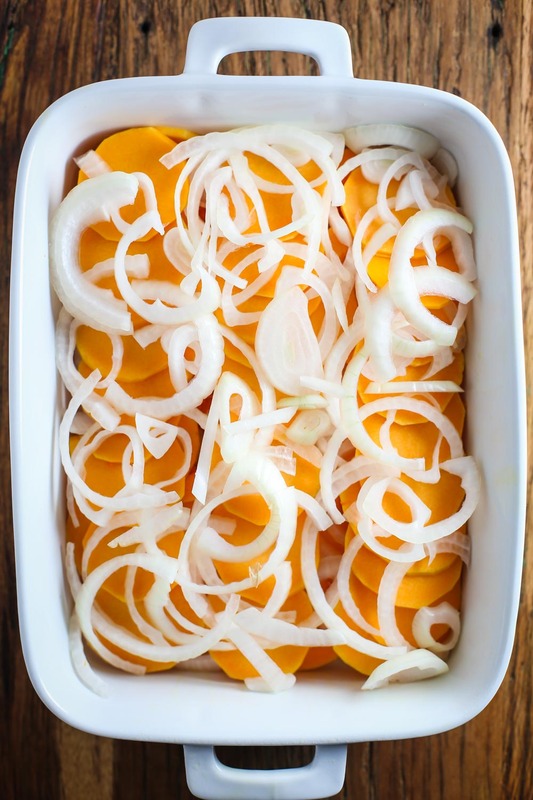 Place 1/3 of the butternut squash in the dish and top with half of the onion. Sprinkle with salt and pepper. Repeat one more time. For the final layer, evenly place the butternut squash on the top and sprinkle with salt and pepper. Mix together the almond milk and veggie stock. Pour evenly over the squash. 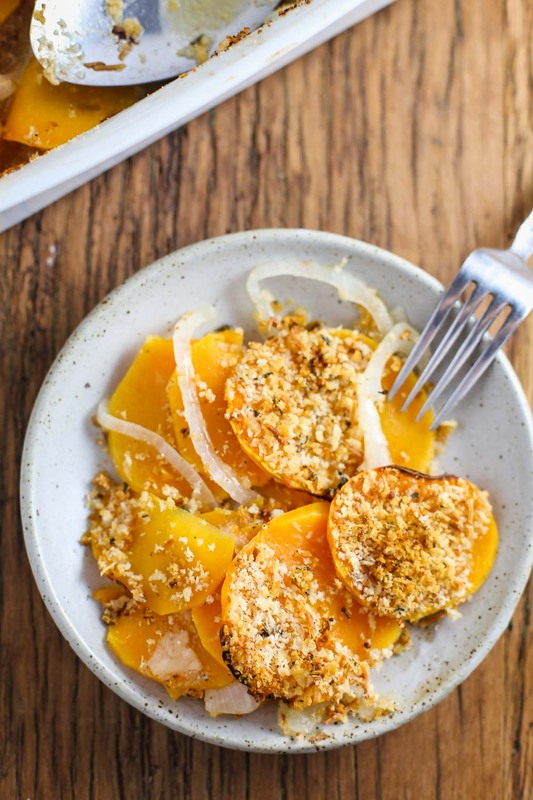 In a small bowl, stir together the breadcrumbs, garlic powder, sage, and parmesan. 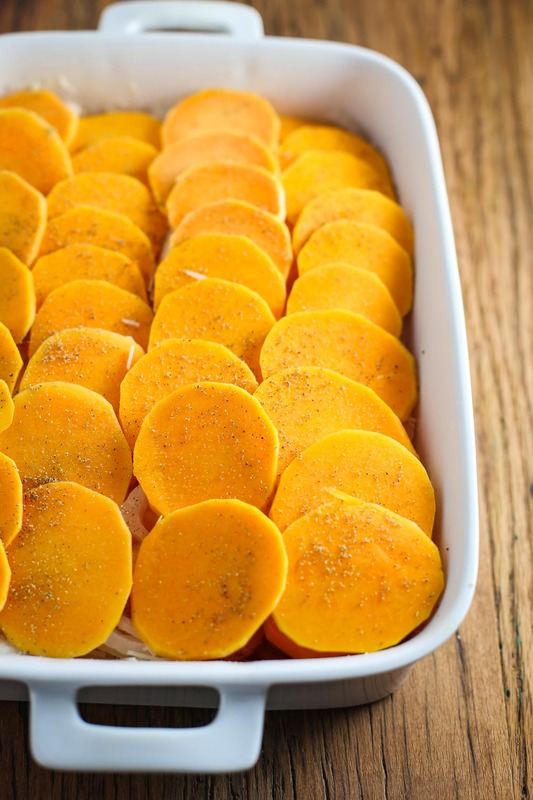 Sprinkle this mixture evenly over the top of the butternut squash. 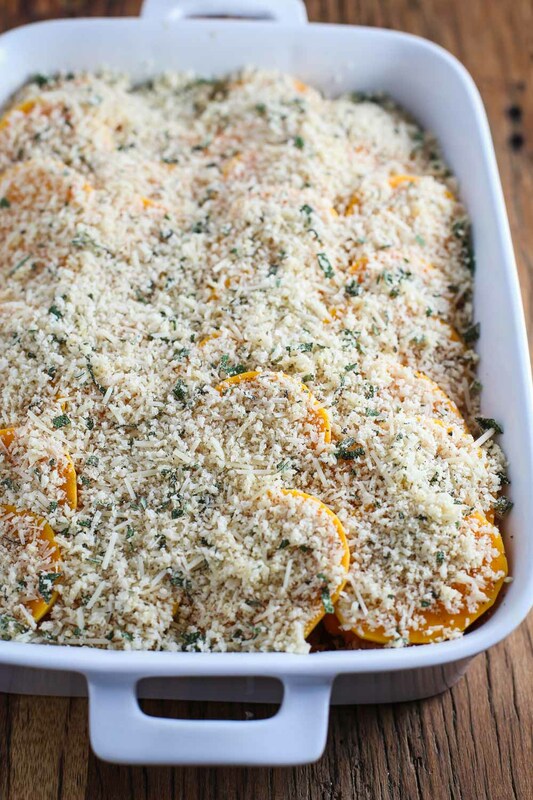 Bake in the oven for 40-50 minutes or until the squash is tender. WOOO!!! Thanks so much for letting me know, Anna. SO glad that y’all liked it!